What’s the most important thing to remember before my waxing appointment? What’s the most important thing to remember before my laser appointment? Is there anything I should take before a facial or waxing service? Please discontinue use of all Vitamin A derivatives, such as: Retin-A, Retin-A micro, Renova, Differin, and Tazorac at least five days before coming into the spa for a facial or facial waxing of any kind. Is there a cancellation fee? What if I’m running late? If you need to cancel or reschedule your appointment, we ask that you provide a 24-hour notice. Canceling within a 24 hour time-frame, as well as missing your appointment, will result in a 50% service charge. Arriving late for your appointment may result in it needing to be rescheduled. What type of payment does Glow Med Spa accept? 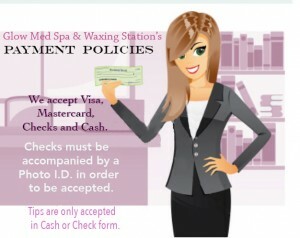 Glow Med Spa accepts Visa, MasterCard, Checks and Cash for payment. Service gratuity to your therapist can be made in Cash or Personal Check. Credit card gratuities are not accepted. We stand behind our products at Glow and offer a 30-day money back guarantee, if you are not satisfied with your purchase. Glow Med Spa also offers a 60-day return for store credit, but can not accept returns of any type after 60 days. One exception to the return policy is Latisse. Please know that since Latisse is a prescription item, we can not give refunds nor credit for returns once it’s been sold. Plus, you can always call and ask to speak to your Esthetician, if you have questions about your new product. Many times their recommendations on application (time of day, amount, etc.) can make all the difference in your satisfaction. To ensure the safety of children and the enjoyment of all clients, we ask that parents or guardians make other arrangements for children while they are receiving services. We promise we will make the hassle to find childcare worthwhile as you relax and enjoy our services! Please remember that monthly specials are not automatically applied to services. To receive the discounted price offered, clients must mention the special applicable to their visit during check-out. Thanks!